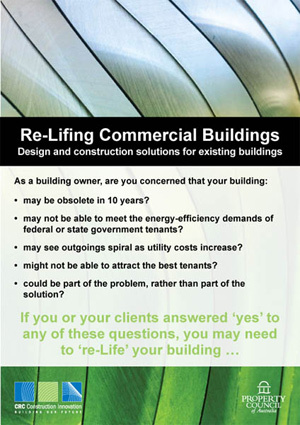 Construction Innovation, in collaboration with the Property Council of Australia, has recently released information on “re-Lifing” design and construction solutions for existing buildings, via the Your Building website. Re-Lifing is the process whereby existing buildings undergo significant refurbishment or transformation in order to extend their useful life. This process allows owners to improve the serviceability of their buildings and apply the principles of ecologically sustainable development. With high construction costs and a greater emphasis on sustainability, owners are increasingly electing to re-Life their existing stock, rather than create new buildings. It is estimated the building sector is responsible for 23 per cent of Australia’s total greenhouse gas emissions – and energy use in buildings is rapidly growing. To achieve a significant reduction in emissions, there is a need to improve current building stock to upgrade the energy efficiency of assets within buildings to deliver a more sustainable outcome. As a building owner, if you are concerned that your building may not meet the energy-efficiency demands of federal or state government tenants or are worried that your building may be obsolete in 10 years, not attract the best tenants or see outgoings spiral as utility costs increase, you may need to re-Life your building. Although the commercial sector’s level of energy use is lower than the residential sector, its energy end use has nearly tripled since the 1970s. Research commissioned by the Australian Sustainable Built Environment Council (ASBEC) suggests the building sector as a whole could reduce its share of greenhouse gas emissions by 30-35 per cent whilst accommodating growth in the overall number of buildings by 2050. This can be achieved by significantly reducing the energy needed by residential and commercial buildings to perform the same services. For example, by replacing equipment with more energy efficient models, at the natural replacement rate, and upgrading the performance of the building shell. Contributions relevant to this topic are sought from industry in this critical area of sustainability.